Our extra lightweight fitted cardigan is smart and versatile choice in knitwear suitable for office wear. The Tastex extralight weight cardogan has proven a very popular choice for women's corporate wear. 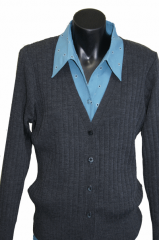 The cardigan shown here is in grey double twist knitted with a ribbed 'drop stitch'. 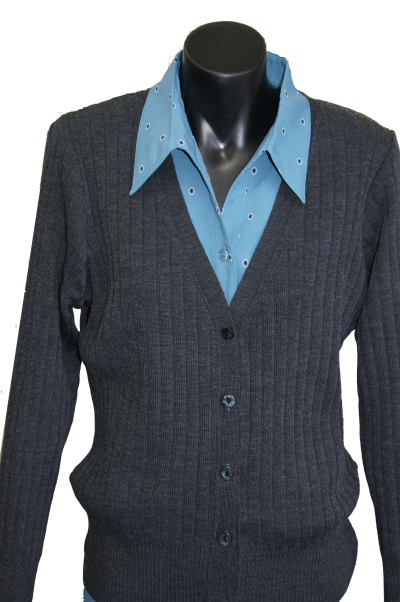 This cardigan is available in any of the standard corporate colours. Our extra-lightweight cardigan can be manufactured using our Soft Wear yarn made from 80% wool 20% nylon or from our 100% Pure Wool yarn, depending upon the colour you choose. Combinations of colours, or special colours, can be knitted to order with bands in your own corporate colours if required.